There's a well-known editor who has publicly proclaimed that all sock patterns "ought to" be offered in a range of sizes, as if anyone (like me) who has ever published a sock pattern in only one size should be publicly flogged with a handful of Addi Turbos. And I'm absolutely in favor of offering as many sizes as is possible. But when I say "possible," I mean provided that re-sizing does not compromise the integrity of the design. Sometimes the math simply doesn't allow a complex sock pattern to be re-sized without significantly changing the sock's appearance. If we insist that a sock pattern shouldn't be published without three or more size options, then we run the risk of (a) banishing many very beautiful, complex sock patterns, and (b) promoting dishonesty in sock sizing. Let me explain what I mean by "dishonesty in sock sizing." Once, in my pre-professional-designing days, I bought a sock pattern by a very well-known designer. The pattern was written for three sizes (64, 72, and 80 stitches around the leg), and I started knitting the medium size. When I got to the transition from ribbing from the leg, the knits and purls of the 2x2 ribbed cuff did not flow smoothly into the knits and purls of the more-complicated leg design, like the pattern photo showed. As I tried to figure out what was going on,I discovered that the sample sock photographed was the small size. And I realized that in order to size up the pattern from 64 stitches while preserving the symmetry, the designer had to add 4 stitches of ribbing on each side of the centered motif on the front of the leg, and likewise 4 stitches of ribbing on each side of the centered motif on the back of the leg. That's 16 stitches added in total. And in fact, that is how the pattern was written for the large size. But the designer included the in-between size even though it was impossible for the ribbing and leg to line up (IMO a very important feature of the design). The medium size simply wasn't as attractive as the other two sizes. The moral of this story is that I just don't feel it's right to pretend a pattern is graded for sizes that look significantly different from the sock shown in the photo. Have you seen The Sanguine Gryphon's Spring 2011 Art Nouveau pattern collection yet? I have a new sock design in it. Willow Tea Room is a toe-up lace anklet named for a Charles Rennie Mackintosh-designed building in Glasgow, Scotland. The rosebud motifs appear on the leaded glass windows and doors, and the lace grid is reminiscent of the chair backs. The pattern model features TSG's Skinny Bugga! in spring/summer 2011 colorway Golden Orb Weaver. Like Betony, WTR has asymmetric toes and arch shaping. And both Betony and WTR have a heel that is identical in appearance and proportions to a top-down flap-and-gusset round heel. However, Betony shapes the sole flap with short rows; WTR shapes the sole flap with decreases and then stitches are picked up along the sides. 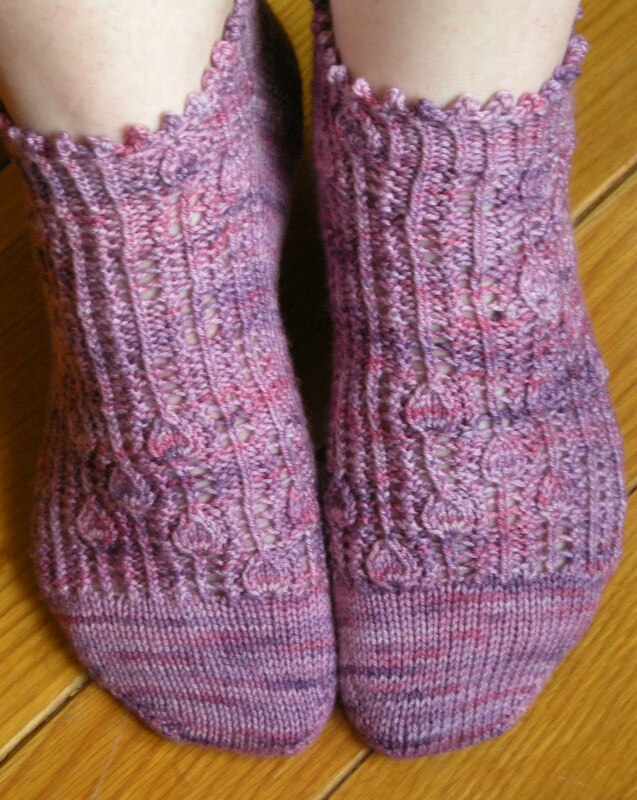 A bit of garter stitch at the sides of the heel back adds interest and coordinates with the garter-and-twisted-stitch lace background on the instep. The sizing for this sock is a little unusual. There are two foot circumferences given, but three foot lengths, as well as directions for adding more foot length. If you have any trouble following the pattern (for this or any other reason! ), please do email me at the address on the pattern. 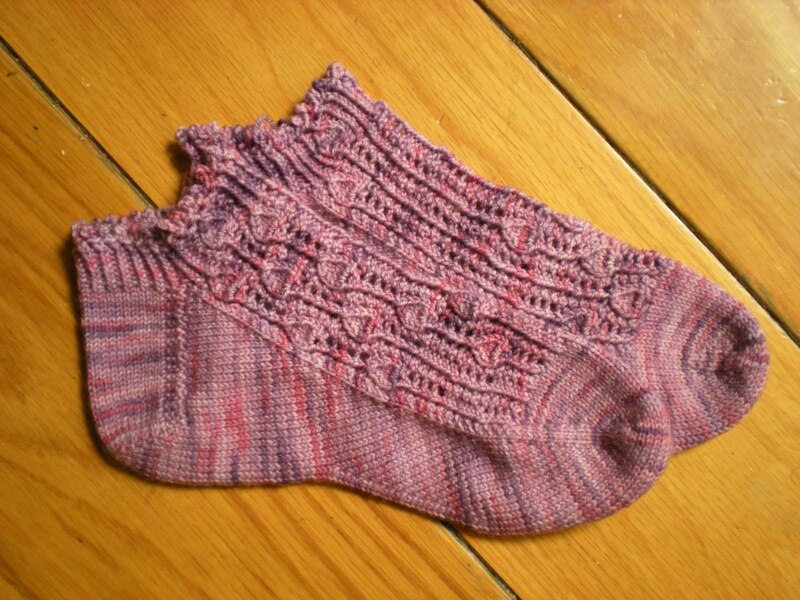 If you have really small feet and like a snug fit, you can still knit WTR. Now, I think it's a terrible idea for a pattern to direct changing the finished size of a sock by changing gauge with the same yarn (that's a whole other post). But it's perfectly fine to change size by changing gauge if you also change yarn weight. If you use TSG's Little Traveler instead of Skinny Bugga!, you can get a very nice sock fabric at around 9 st/in and follow the instructions for the size M circumference. The Little Traveler version of the Golden Orb Weaver colorway is called The Five Continents.